Designed for noticeably thinning or fine hair, Nioxin shampoo delivers denser-looking hair and a healthy shine while protecting the scalp. The brand’s commitment to innovation, supported by 25 years of research, have enabled them to be able to help more than 3 out of 4 men and women in the U.S. who experienced thinning hair. NIOXIN’s innovative solutions have gained industry recognition year after year. Related Post: All of the Best Hair Growth Products in One Place! 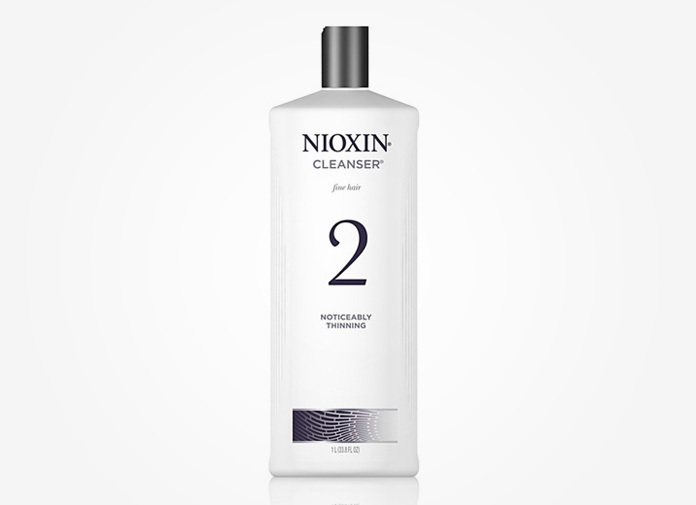 Nioxin 2 Cleanser: Water, Sodium Laureth Sulfate, Sodium Lauryl Sulfate, Cocamidopropyl Betaine, Sodium Citrate, Citric Acid, Sodium Xylenesulfonate, Sodium Chloride, Cocamide MEA, Sodium Benzoate, Salicylic Acid, Mentha Piperita (Peppermint) Oil, Menthol, Mentha Arvensis Leaf Oil, Tetrasodium EDTA, Methylparaben, Propylene Glycol, Camellia Sinensis Leaf Extract, Cystine Bis-PG-Propyl Silanetriol, Lecithin, Urtica Dioica (Nettle) Extract, Serenoa Serrulata Fruit Extract, Humulus Lupulus (Hops) Extract, Citrus Paradisi (Grapefruit) Peel Extract, Saccharomyces/Magnesium Ferment, Biotin/Folic Acid/Cyanocobalamin/Niacinamide/Pantothenic Acid/Pyridoxine/Riboflavin/Thiamine/Yeast Polypeptides, Yeast Extract, Saccharomyces/Iron Ferment, Saccharomyces/Copper Ferment, Yellow 5, Saccharomyces/Silicon Ferment, Saccharomyces/Zinc Ferment, Phenoxyethanol, Blue 1, Red.